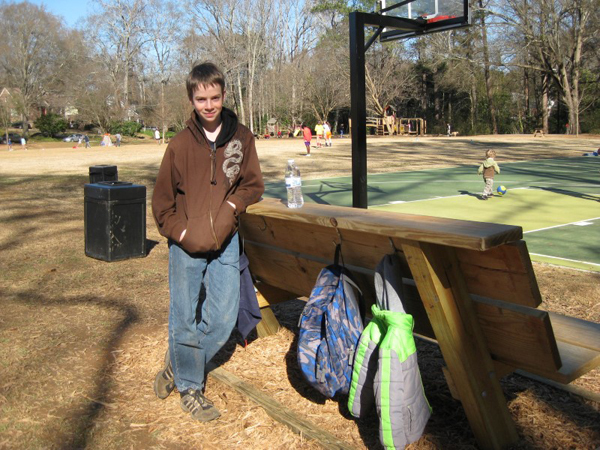 Dylan’s Eagle project came about after he noticed coats and backpacks lying in the mud around the basketball court at Winnona Park Elementary. He worked with Principal Wiseman to design a large, sturdy wooden bench beside the court. Dylan’s crew built the bench and secured it in concrete mixed with water hauled from the creek. They built a base of landscape timbers and mulch to keep the ground from getting muddy. The bench holds 6 people to watch a game and has heavy-duty hooks for hanging coats, gym bags and backpacks. At Mr. Wiseman’s request, Dylan also built 3 task-sorter boxes for the visually impaired students at Winnona. Dylan Wyatt earned his Eagle rank on February 24, 2015 at age 13, 2 years and 11 months after joining Troop 175.